Free space optical — laser — communication in space hit a lot of benchmarks over the past week. The SpaceDataHighway operated by Airbus achieved 10,000 successful laser connections, BridgeSat laser terminals will be put on ICEYE’s commercial radar satellites, and Analytical Space’s Radix pathfinder went into orbit on the OrbitalATK OA-9 supply mission for deployment via the International Space Station (ISS). With some catches, laser communications can move vast quantities of information between satellites and ground stations. A laser transmitter and receiver have to lock on to each other, making sure the light beam is precisely pointed at the receiver before information starts moving. Lasers are affected by atmospheric conditions, with humidity potentially degrading speeds, while fog and clouds block transmissions; it helps to have a ground station at a higher elevation for less atmosphere and moisture in the way. Finally, airplanes and laser don’t mix, with the potential to temporarily blind a pilot — or worse — if the laser isn’t eye-safe. But when it comes to sheer speed, the benefits of laser communications outweigh its disadvantages. Airbus and the European Space Agency (ESA) established the SpaceDataHighway program as a public-private partnership to test and refine laser communications between low-orbiting and geostationary satellites as a high-speed relay system. The system has achieved more than 10,000 successful laser connections, moving more than 500 terabytes of data in the first one and a half years of routine operations. A geosynchronous data relay satellite, EDRS-A, moves data via laser at speeds of 1.8 Gbit/s, enabling earth observation satellites to move large amounts of data quickly to European monitoring centers. SpaceDataHighway is capable of moving up to 40 terabytes of data a day from the Sentinel-1 and Sentinel-2 satellites, but is open for potential use by other satellites, unmanned aerial vehicles (UAVs) or aircraft. In 2019, the system will relay data from the Columbus module of the ISS, with Airbus-built Pleiades Neo high-resolution optical satellites using the system starting in 2020. A second relay satellite, EDRS-C will be launched in 2019, with a third one to be launched in the future for near-global coverage. New small satellite companies are so far bypassing SpaceDataHighway for their own solutions, using emerging commercial alternatives and even building their own space relay networks. 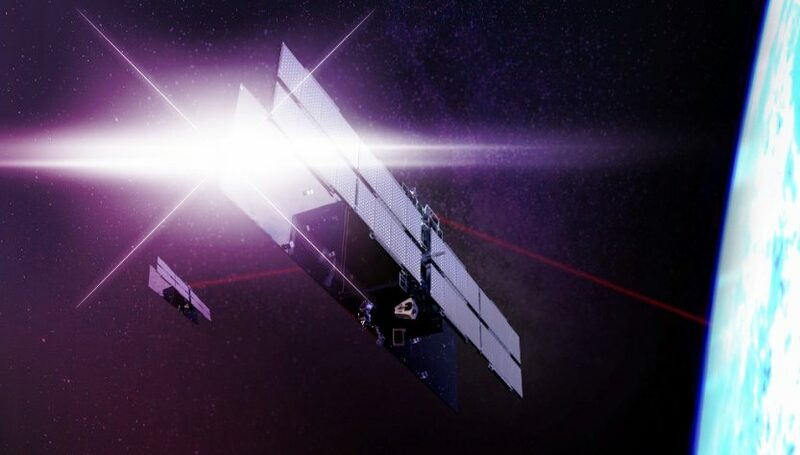 Finnish-based ICEYE will incorporate BridgeSat‘s low-cost laser terminal into its 100 kilogram-ish satellites and use BridgeSat’s optical ground network to receive radar imagery from ICEYE’s radar microsatellite constellation. The BridgeSat Compact Laser Comms Terminal (CLCT) provides up to 10 Gbps LEO downlink speeds in a compact package weighing less than 2 kilograms. Needless to say, it also works well with BridgeSat’s optical ground station network. ICEYE plans a total of 18 synthetic aperture radar (SAR) microsatellites, enabling companies to get radar imagery with a resolution of 3 meters of any place on Earth within a few hours or less. SAR can see through darkness and clouds, providing a key advantage over optical satellites. Laser links in combination with BridgeSat’s network will enable ICEYE to get images to the ground and its customers faster. Analytical Space (ASI) has a different business model for laser communication. Radix, its first satellite, was launched on the OA-9 cargo mission to ISS earlier this week. The pilot nanosatellite will demonstrate a hybrid RF/optical data relay in space, using RF to move data from LEO satellites, then transmitting data quickly to the ground via laser. ASI also has a secondary Internet of Things (IoT) data relay play in mind once it demonstrates the in-orbit communications technology.